Ellie Mae Inc (ELLI) Shares Sold by Principal Financial Group Inc.
PepsiCo’s (NYSE:PEP) latest version of Gatorade is certified organic by the U.S. Department of Agriculture. The USDA ensures organic products are more natural and less harmful to the environment. The new product, called G Organic, contains seven ingredients total: water, organic cane sugar, citric acid, organic natural flavor, sea salt, sodium citrate and potassium chloride. Every step of the manufacturing process was approved by the USDA. PepsiCo has been working on the new version of Gatorade for the past two years. 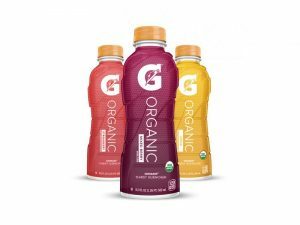 According to Brett O’Brien, Gatorade’s senior vice president and general manager, G Organic has a comparable amount of electrolytes and carbohydrates as other Gatorade products without boosting calories. It has 120 calories per single serving, about the same as in the flagship brand. The new product is now available in some Kroger Co. supermarkets. Over the next few weeks, the rollout will be expanded to select grocery, natural and convenience stores across the United States. It will be available later this fall on Amazon. G Organic is available in strawberry, lemon and mixed berry varieties. The new drinks cost 50 cents more than for Gatorade Thirst Quencher, the nonorganic equivalent. The suggested retail price is $1.69 for a 16.9-ounce bottle. At first, G Organic will only be sold in single-serve bottles. Gatorade was originally developed in a lab at the University of Florida in 1965. The brand was acquired by PepsiCo as part of its acquisition of Quaker Oats in 2000. Gatorade currently controls 70 percent of the sports-drink market. Since its acquisition, Gatorade has introduced several new products, including a low-calorie version, protein powder, and gummy chews. PepsiCo is facing increasing pressure as consumers are focused more than ever on the ingredients used to make the products they buy. Organic food industry sales in the U.S. up rose 11 percent in 2015 from the year before, reaching $43.3 billion. Broader food sales gained 3 percent over the same period. G Organic is the first major sports drink to cater to customers looking for more natural components. To be considered organic, the new Gatorade had to eliminate artificial ingredients. It remains to be seen whether America’s growing natural-food movement will embrace a product that was originally created in a lab with artificial flavors and colors.